…you’re away in a warm sunny country, with your mates, riding your bikes. When you’ve finished riding your bikes for the day you are contractually obliged to expend as little energy as possible by lying around, feet raised, watching movies and larking around with each other. Oh, and if that wasn’t enough, the man from Castelli has just showed up with a van-load of free kit for you to dish out among yourselves. Forgive me for bemoaning my desk job, raising my fists to the sky, and wailing…AAARRRGGGHHH! 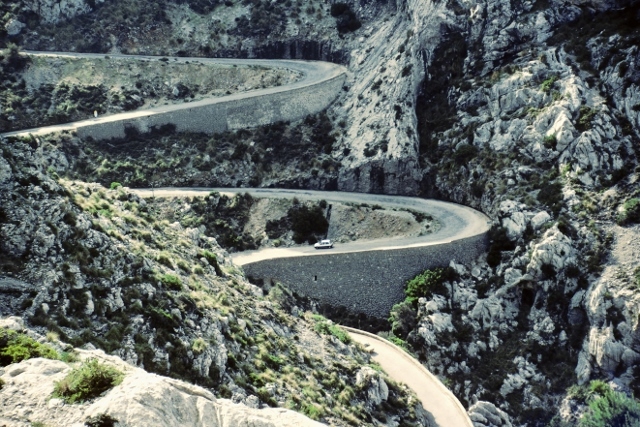 The Mountains of Mallorca – anyone fancy a spot of warm weather training? Of course there are times when the life of a pro-cyclist looks like a pretty horrendous prospect; two weeks and a couple of thousand kilometres into a grand tour, and facing your third consecutive day in the Alps would no doubt be a bit of a challenge, for example. How about taking on a near-300km spring classic in the snow and ice (a la Milan San-Remo 2013)? Not my idea of fun. Swings and roundabouts, I guess…good times and bad. …I like to imagine a scenario where all this brand spanking new team kit turns up for the new season, and the pro’s all have to scrap and scrabble for the stuff that fits them – the team leader gets all the good stuff, of course, then the pecking order kicks in leaving the neo-pro’s and the less popular team members to fight over the scraps, desperately trying to avoid being left with last year’s shorts and jersey’s that are a size too small. The cycling media also likes to fill our time with photo’s of those odd occasions where a rider is still officially contracted to one team, but has transferred to another, and so begins his winter training contractually obliged to wear the kit of his soon-to-be former employers (a bit like school days, where the poor kid who forgets his P.E. kit has to wear whatever old bits of kit happen to be lying around in the lost property box). To take it one step further his former team should perhaps maximise the embarrassment by insisting their former charge train with his new team mates wearing only his pants (for the younger readers out there, not too many years ago it was common practice at school to be forced to do your physical exercise in your underwear if you’d forgotten to bring your kit…i’m guessing that’s not the case in 2014! It was a more innocent time). Having said that, judging by the new Team Sky skinsuit as modeled by Chris Froome recently flesh is a look that we might have to get used to seeing a bit more of in 2014 (you are clicking this link at your own risk..! Once you’ve seen the picture, you cannot un-see it). Of course, even here in the tail end of the off-season as these lucky riders take delivery of mountains of free kit and shiny new bikes, we should spare a thought for the poor unfortunate riders of the Belkin team. Imagine their excitement when they discovered that their bike supplier was changing for 2014 from functional Giant, to beautiful Bianchi, only to watch in horror as their new bikes rolled off the back of the truck. That, lads…is green. Bright Belkin green flowing into classic Bianchi celeste…have two colours ever clashed quite like that before? There will be surely be a few in the Bianchi design department with furrowed brows, bemoaning this compromise to their classic Italian looks. For the Belkin team that is their lot for the next 12 months…you have to feel for them. First, you’re right about the Bianchi, I’d love to know who to laugh at for that one… For the skin suits, you have to look at the bright side my friend… Not long before the WOMEN don them! WOOHOO! Talk about an explosion in interest in women’s cycling! As for the Bianchi – imagine a scarlet Ferrari with a blue rear end…same thing really. A good friend of mine used to be a pro cyclist, after his retirement, he worked for Riis, then Sky, now BMC. He says there are some things he misses about his days racing, but many more that he does not miss at all…. I can well believe it…it’s easy to look in from the outside with rose-tinted spectacles, but that is one TOUGH life! I expect he has one or two anecdotes that are worth a listen. Yeah, he has a bunch about a now disgraced face of American cycling…. Spare us the pain of looking at elite strange men’s bodies while cycling. Ha ha, you are not alone in expressing that sentiment!